The Vatican drew fire from the Israeli government for allegedly turning the recent Synod for the Middle East into a "forum for political attacks." Vatican spokesman, Father Federico Lombardi, downplayed the criticism, which was lodged by Israel’s deputy foreign minister. Father Lombardi said the Synod was "largely positive" and that the statements of individual participants did not reflect the overall consensus of the synod. Tensions flared in response to a statement from one synod participant, Melkite Archbishop Cyrille Salim Bustros of Newton, Mass. This, the bishops said, "is not acceptable." Rather, they said, "recourse to religion must lead every person to see the face of God in others and to treat them according to their God-given prerogatives and God’s commandments, namely, according to God's bountiful goodness, mercy, justice and love for us." Asked to clarify what this passage meant, Archbishop Bustros responded that Christians cannot speak of a specific "promised land," because Jesus Christ had come to establish the Kingdom of God in the world and to make all who follow him his "chosen ones." 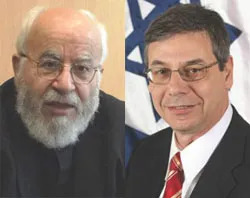 These comments were met by "disappointment," from Israel’s deputy foreign minister Danny Ayalon, the leader of the Israeli delegation that is participating in bilateral talks with the Holy See to determine the official status of the Catholic Church in the Holy Land. Ayalon complained that, the "important synod (had) become a forum for political attacks on Israel in the best history of Arab propaganda." The synod, he added, "was hijacked by an anti-Israel majority." He added that the Israeli government was "appalled" at Archbishop Bustros' words and called for the Vatican to distance itself from them. The "outrageous" comments, he said, "are a libel against the Jewish people and the state of Israel and should not be construed as the Vatican's official position." In a message aired by Vatican Radio Oct. 25, the Vatican spokesman aimed to deflate the controversy. He said the final message is "the only common written text approved by the synod," and that the "great richness and variety of contributions given" by those participating in the synod "must not be considered on their own as the voice of the synod as a whole." The synod participants hope to enact change in the Middle East through a variety of propositions released at the conclusion of the two-week meeting. The synod fathers made 44 propositions to Pope Benedict XVI, including the possibility of allowing married priests from Eastern Churches to work outside the historic boundaries of their rites; initiatives for more intensive formation of seminarians and all Christians in the Middle East; and a wide variety of other pastoral ideas for the Churches there, such as broader outreach through the use of new media. Pope Benedict XVI will examine these propositions and the synod discussion to later issue an Apostolic Exhortation to clarify details of the synod proceedings. This is a papal document in which he studies the situation in the Middle East and offers his teachings to guide the Church's future there.